ORLANDO, Fla. (AP) — No. 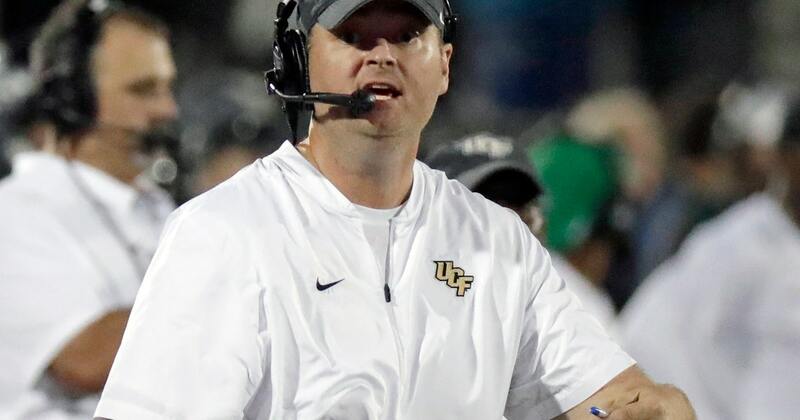 11 UCF, heavily favored to beat Navy to remain unbeaten and extend the nation’s longest winning streak to 22 games, insists the Knights aren’t paying attention to chatter about their chances of winding up in the College Football Playoff. “We talk about it every day. … Outside noise has no impact on what we are,” coach Josh Heupel reiterated. The Knights (8-0, 5-0) dropped two spots in this week’s Associated Press Top 25, even though they beat Temple 52-40 to extend their winning streak to an American Athletic Conference-record 21 consecutive games. UCF remained No. 12 in the latest CFP rankings, despite yielding 670 yards defensively and needing McKenzie Milton to rally the Knights from a halftime deficit to take sole possession of first place in the AAC East Division. Milton, returning from missing one game with an undisclosed injury, threw for 312 yards and three touchdowns while also rushing for a TD. “He played championship football. Found a way to help us go 1-0,” Heupel said, repeating the familiar one-game-at-a-time refrain UCF routinely sings after victories. Navy (2-7, 1-4) has lost six straight and is coming off a 42-0 loss at Cincinnati, which re-joined UCF this week as the only AAC teams in the Top 25. The once-beaten, 25th-ranked Bearcats travel to Florida to face the Knights next Saturday. “It’s going to be another tall order for us,” Navy coach Ken Niumatalolo said. The Midshipmen are finishing a three-week stretch in which they will have played No. 3 Notre Dame, Cincinnati and UCF, who are a combined 25-1. UCF ranks third nationally in total offense, averaging 548.8 yards and 45.4 points per game. The Knights have scored at least 30 points in 21 consecutive games, the longest such streak in the country. Milton, eighth in Heisman Trophy balloting a year ago, has thrown for 2,109 yards, 19 touchdowns and just five interceptions. Greg McCrae is coming off rushing for 188 yards and one TD against Temple. “They’re pretty much unstoppable on offense,” said Niumatalolo, whose defense is allowing 441.4 yards and 36.2 points per game. Navy has one of the most productive running attacks in the nation, ranking third behind Georgia Teach and Army at 286.9 yards per game. The bad news is the Midshipmen are coming off being held to a season-low 124 yards on the ground in the loss to Cincinnati. “We’ve never been beat like that,” Niumatalolo said. Heupel said preparing to face a triple option scheme is a challenge, noting it’s difficult to simulate Navy’s offense in practice. UCF is one of four undefeated remaining in the FBS, along with Alabama, Clemson and Notre Dame — the top three teams in the AP and CFP rankings.